What’s the best Superman ever? There are a lot of contenders, most notably “All-Star Superman” by Grant Morrison and Frank Quitely and “Whatever Happened to the Man of Tomorrow” by Alan Moore, George Perez, Curt Swan and Murphy Anderson. 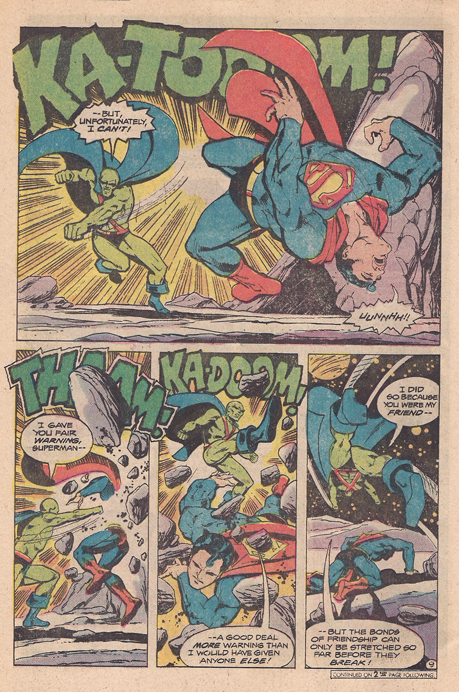 My vote for Best Superman Ever goes to Jim Starlin’s brief run on the character beginning with issue 26 of DC Comics Presents. The main hurdle a Superman writer must overcome is how to create a sense of danger in an adventure story about a supergod. One solution is to give him other supergods and an infinite universe in which to fight them. 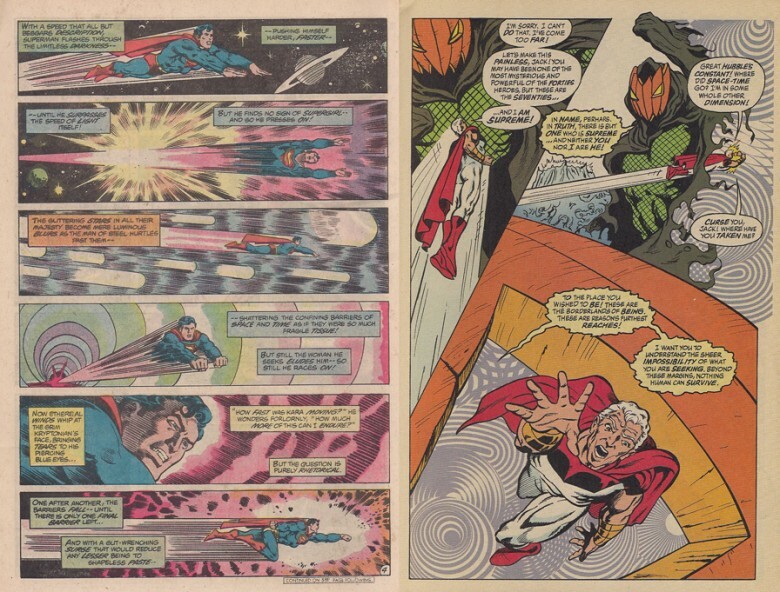 Starlin lined up an array of grandly-designed cosmic threats to throw at Superman and resolved the conflicts with clearly choreographed strategic combat on a galactic scale. 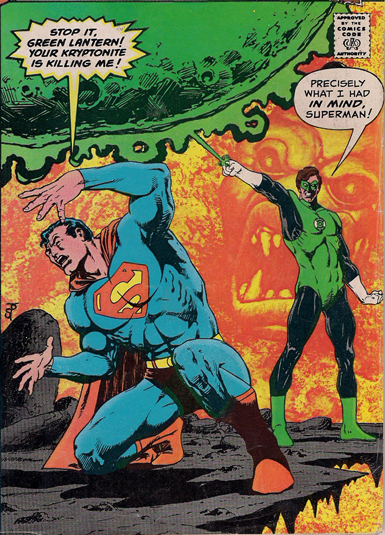 At the beginning of Starlin’s inaugural issue, Superman must live with the consequences of failing to save a man’s life as he’s whisked away to fight an alien demon in the form of a body-snatched Green Lantern. The highlight of the battle, and the big moment depicted on the cover is when Green Lantern almost kills Superman with a ring-generated HO scale World of Kryptonite. 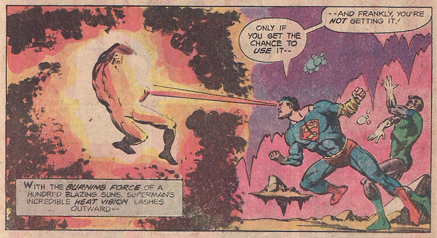 It’s always a treat when Superman lets loose with his heat vision. Through a quirk of this dimension’s time flow, the heroes are able to return in time to save the falling construction worker from the beginning of the story. Starlin later used a similar gimmick in an issue of his creator-owned sci-fi series Dreadstar. 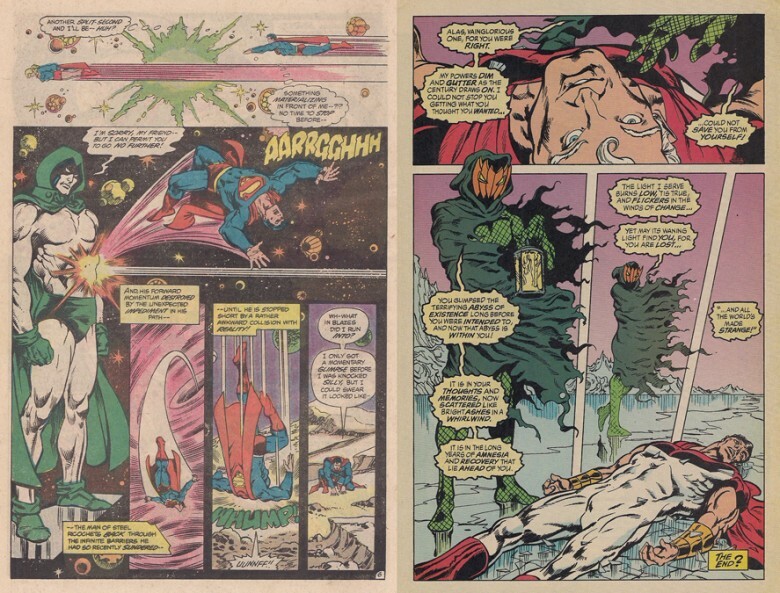 That initial adventure was just a prelude to the main event, a three-parter where Superman fought Martian Manhunter and Mongul, Starlin’s DC translation of his famous creation and post-Avengers-credits movie star, Thanos. Mongul really would be a poor man’s Thanos if it weren’t for the fact that he pilots a mega-Death Star called WarWorld which has since been used in perpetuity by DC Comics. Starlin is a student of Jack Kirby and as such he pulls out one of Kirby’s least-utilized tricks: if you want something to seem really honking big, have it pass behind a planet or something. Starlin (or possibly dialogue writer Len Wein) spells it out more explicitly than Kirby ever did with his casually mind-blowing depictions of cosmic immensity like Galactus’s home planet. 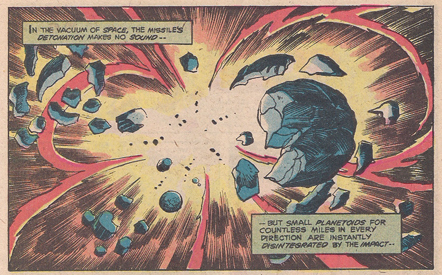 The trick comes out again two pages later for the demonstration of WarWorld’s giant universal doomsday missile. Then a third time, three pages later. 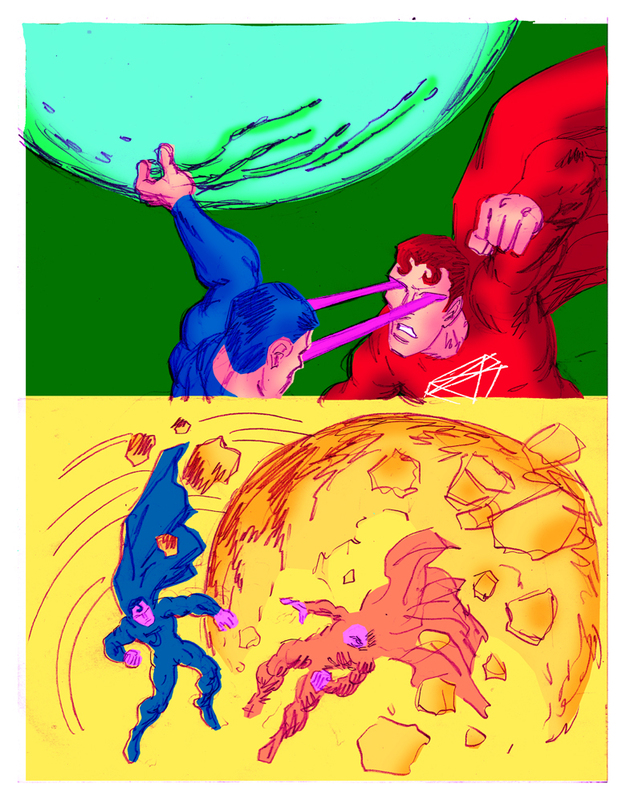 To top such apokoliptic sturm und drang, Superman had to fight God. This is the high point of the run. The issues after this are good and all, but the problem with constantly upping the stakes is that you eventually hit a point of no return. Superman does exactly that, in search of his lost cousin, he breaks the reality barrier and the unstoppable force meets the immovable object, DC Universe’s second banana, The Spectre. Warned to proceed no further, Superman surrenders to a higher power. He realizes the opponent he was fighting all along was the DC Universe’s God, incarnated as a ball of light with fancy writing in it. 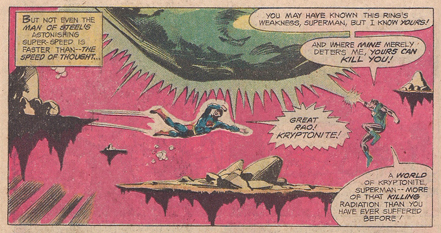 When Superman met God, Superman relented. When Shatner met God, the Starship Enterprise blasted him in the face with a photon torpedo. 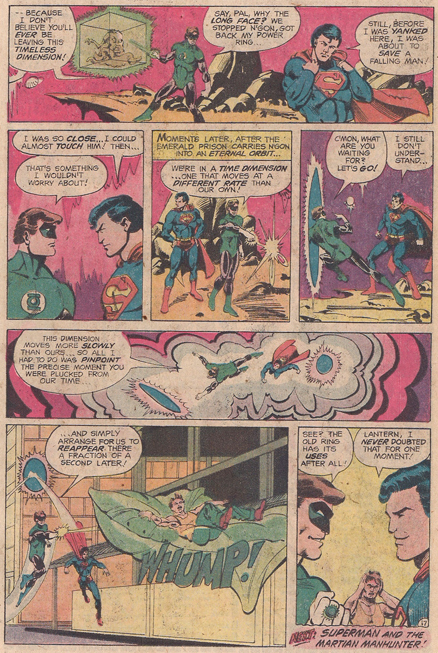 This high point of Starlin’s story clearly made an impression on Alan Moore and Rick Veitch, inspiring their “How Low Burns the Lantern” for Rob Liefeld’s super-cipher Supreme. He meets the Awesomeverse’s Spectre counterpart, Jack Of Lanterns. 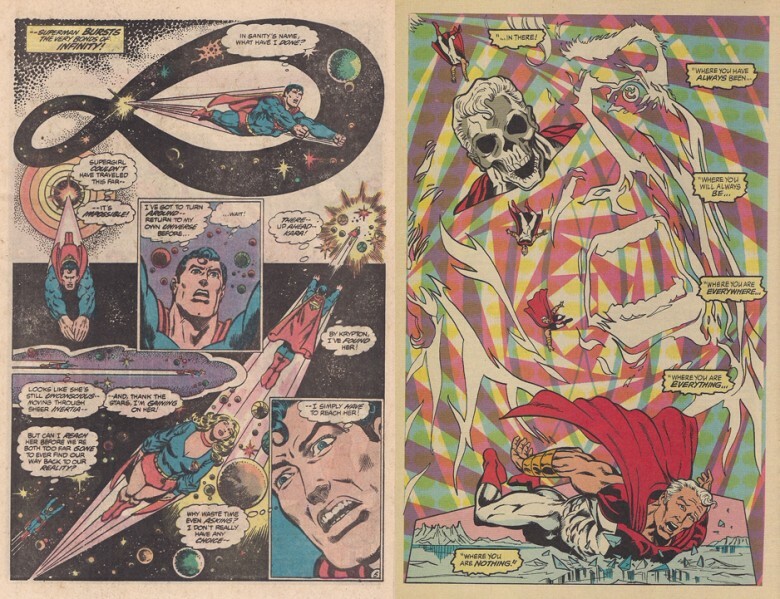 In this story Supreme (SUPerman extREME) does what Superman didn’t have the stones to do, he brazenly breaks through the barrier separating the mundane from the divine. On the other side of this barrier, instead of finding God, he finds a gaping nothingness, the absense of God in Moore’s watch-without-a-watchmaker superhero cosmology. Supreme is consumed by the emptiness he finds on the other side. By the end of this retro-continuity flashback Supreme is left to wander mindlessly through the universe until the beginning of Moore’s first issue writing the character. Was Moore making a dig at his employer’s handling of the character prior to his arrival or am I reading too much into the meta-text? To say that Supreme was a mindless Superman before Moore came along is a fair description of the arc of the series, which is itself a candidate for one of the all-time great Superman stories. Supreme, his universe and indicia are TM and copyright Rob Liefeld, Inc. Wait, What? Ep. (15)1: What Now? | Wait, What? Well said! 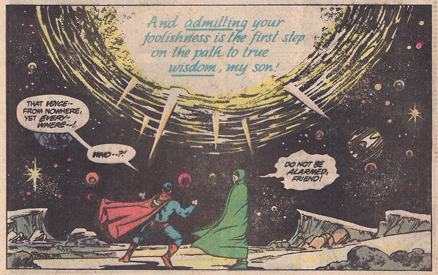 Classic Starlin, and a ton of ideas that have become tropes in the years intervening — like Warworld passing behind a sun. 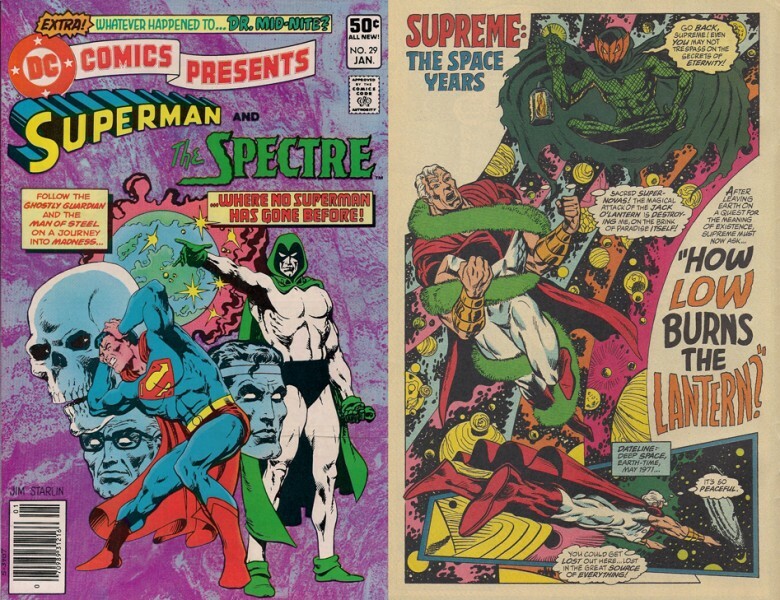 This arc was so good that Alan Moore copped the Superman vs. Spectre thing for his Supreme reboot.